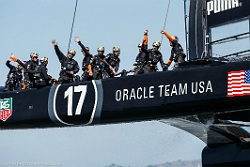 SIS LIVE: onboard broadcast cameras - America's Cup. 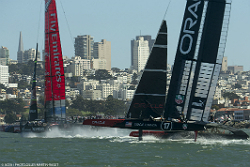 Milton Keynes, 26th September 2013: The 2013 America’s Cup came to its dramatic conclusion in San Francisco Bay on 25th September with ORACLE Team USA emerging victorious having staged an impressive comeback to reverse an 8-1 deficit and beat Emirates Team New Zealand by 9 races to 8. SIS LIVE was there providing unprecedented onboard coverage that has received plaudits from all over the world. SIS LIVE has been involved in the broadcast of the competition from the start, back in 2010, with revolutionary technology allowing viewers to feel as if they were part of these exciting races. Throughout the competition the SIS LIVE special cameras team has been working closely with the yacht designers and racing teams to ensure that the onboard broadcast technology was as lightweight as possible and unobtrusively rigged to prevent any disruption to the onboard activities. The ingenuity of the SIS LIVE teams has been apparent to a global audience over the last few weeks and the coverage has been seamless. Onboard coverage from each AC72 came from 6 agile and 1 fixed camera systems controlled by 2 operators, with 4 live feeds available to the director at any one time and switching used to select the four active sources. The director also had the option of seeing 2 quad split screens on his production stack. 16 channels of sound were captured from each yacht, including from SIS LIVE’s in-house designed 5.0 surround sound microphone, deck FX mics, radio mics on each of the crew members and 2 hull mics rigged inside the hull to capture the creaks and groans of the boats. SIS LIVE also handled the transmission and reception of all remote camera sources using its innovative RF over IP system and spectrum management expertise.